If you’ve ever made ice cream cone cupcakes (and even if you haven’t! 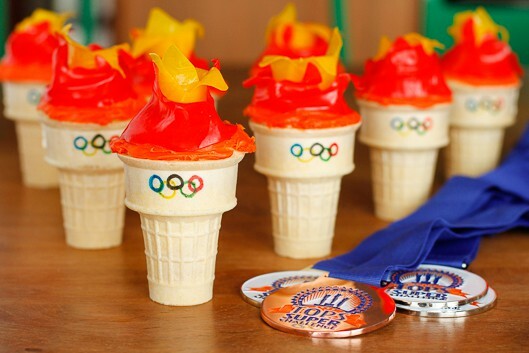 ), these adorable Olympic torch cupcakes will be a cinch to make… Using Fruit Roll-Ups for the flames is genius! Go USA!!! I still remember the first time I had an ice cream cone cupcake… My mom made them as a birthday treat for me to take to school in first grade. I thought they were seriously the coolest thing ever — and I still think they’re a pretty fun treat, as do my own kids! 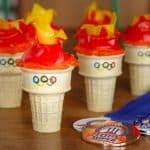 Luckily ice cream cone cupcakes are every bit as easy to make as regular cupcakes, and they’re even more fun when we turn them into Olympic torch cupcakes to celebrate the upcoming Olympics! 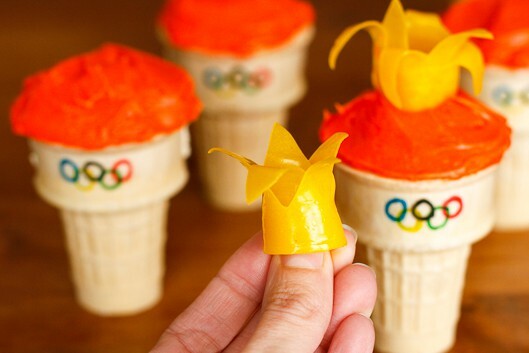 These cute Olympic torch cupcakes start as basic ice cream cone cupcakes. I chose to use a plain white cake mix and these ice cream cones. I specifically chose these cones because they didn’t have loads of detail on them, leaving a nice flat area to draw the iconic Olympic rings. I’ve seen special pans specifically made for baking ice cream cone cupcakes, but I’ve found that a regular loaf pan works just as well. One pan holds eight cones perfectly and will easily keep them upright during baking. Simply prepare the cake mix as directed on the back of the box, and then fill the ice cream cones up to the top ring as shown. Bake and you’re ready to turn them into Olympic torch cupcakes! 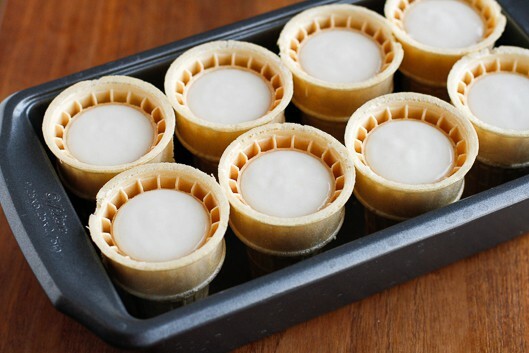 Stand the ice cream cones up in a loaf pan. Eight cones should fit in a single pan. Prepare the cake mix as directed on the back of the box, and pour the batter into the cones to the top inside ring. Bake at 350 degrees for 20-25 minutes, until a toothpick inserted in the center comes out clean. Using edible food color markers, draw the 5 Olympic rings on the front of each cone. Choose a store-bought orange frosting or tint frosting orange with food coloring, and frost the top of each ice cream cone cupcake. Cut fruit roll-ups into flame-like shapes with kitchen scissors and arrange on the top of each cupcake to look like a torch. 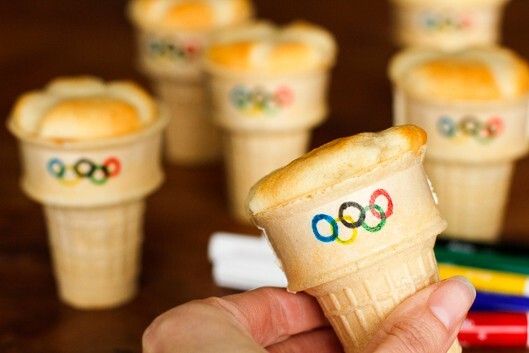 Once you have the ice cream cone cupcakes made, turning them into Olympic torch cupcakes takes very little time. If you want to add the Olympic rings, as I did, you’ll need to pick up a package of these edible food markers. These colorful food-safe markers can be used to draw on cookies, bread, candies and much more! In hindsight, I probably should have started with the yellow ring. The yellow marker has a tendency to smear the darker colors when writing over them, but I’m still very pleased with how they turned out. PIN IT NOW! 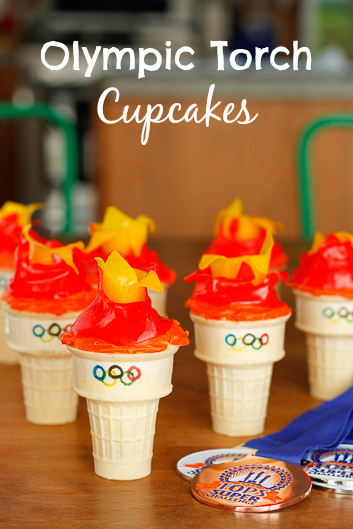 CLICK HERE TO ADD THESE OLYMPIC TORCH CUPCAKES TO YOUR PARTY IDEAS BOARD ON PINTEREST! After drawing on all of the rings, you can go ahead and frost the tops of the cupcakes. This vibrant orange-colored frosting is perfect for this task, but you can tint regular white frosting with orange food coloring if you can’t find it. For the flames I used the yellow and red Fruit Roll-Ups that come in this variety pack. I like the combination of the yellow and red paired with the orange frosting, but regular strawberry Fruit Roll-ups can be substituted if you can’t find them. I’ve also seen yellow and orange Fruit by the Foot, so just take a look around to find something similar. 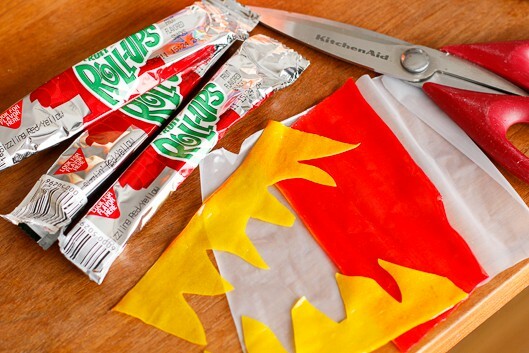 To make the flames, I first cut the Fruit Roll-Up in half where the yellow and red meet with a pair of kitchen scissors. Then I cut each strip into a flame pattern, ending up with two yellow flames and two red flames from each roll-up. I rolled the yellow flames up into a cylinder, pressing it together firmly where it meets, and pressed it into the top of the frosted cupcake. I then draped the red flame around the outside of it. The red doesn’t quite reach all of the way around, but I’m perfectly okay with that. You can add an additional small strip in the back if it truly bothers you. I know sometimes I tend to get a little caught up in trying to achieve perfection, but often good enough is more than okay. You know? Are you planning to watch the Olympics Opening Ceremony? 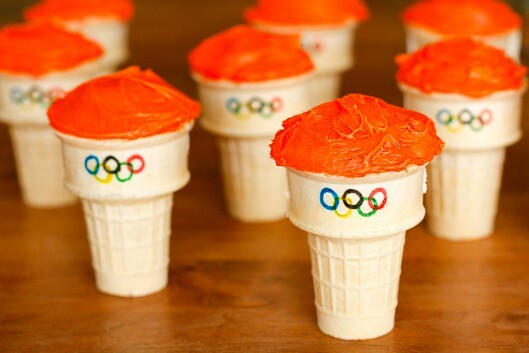 We’ll be huddled around the TV to watch while enjoying our Olympic torch cupcakes for sure! I’d love to see how your Olympic torch cupcakes turn out… Tag me @Unsophisticook on Instagram or use the hashtag #Unsophisticook so I can check it out. Enjoy! Sheesh, I can’t believe I put Kellogg’s — you are so right! I don’t think my store had the Cherry Wildfire, but I will definitely look for those.